Mole National Park, in the northwest of the country, is Ghana's largest reserve and the best place to do some game viewing. The terrain is mostly flat savanna which makes it ideal for spotting animals. Visitors are likely to see elephants, warthogs, hippos, buffalos, crocodiles, baboons, monkeys and assorted antelope; impressively, the park is home to more than 90 mammal species. It is also possible to see predators like lions, leopards and hyenas, but sightings of these animals are more rare. Although Mole National Park has a wealth of wildlife, travellers should note that the park's infrastructure has never been developed for tourism and they should not expect much in the way of amenities. A trip to Mole is still very much an adventure. 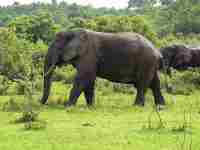 Poaching is a big problem in the reserve, but shouldn't be an issue for tourists. The best time to visit the reserve is in the dry season, between November and April, because the roads often become impassable when it is rainy and wildlife is more difficult to track down. The best spots to find animals during the long dry season are the watering holes left behind when the ephemeral rivers of the park slowly dry up. The park entrance is close to the town of Larabanga.